Join Moon Games and Play Wold Cub Slots Today! A mix of beautiful animals are present on the 5 reels and 20 paylines of Wolf Cub Slot. Trigger loads of features for a great number of wins! Arctic wolves are one of the rarest animals to be spotted. Why? Its simply because they all live is the North Pole area, where is it extremely cold. Wolf Cub slots is a 5 reels and 20 paylines slot game that features Wild replacements, Scatter symbols, Free Spins and a Blizzard Feature. Benefit from the Wolf Cub symbol, which is the highest paying symbol of the game! NetEnt has once again come up with a slot game with enhances sound effects and cutting edge graphics. 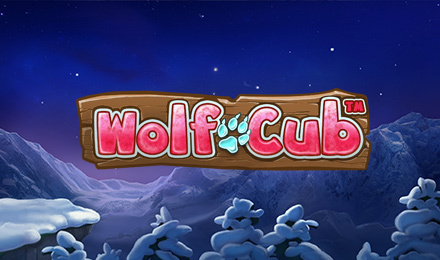 Start your arctic adventure now on Wolf Cub Slot!